As for diversity, what remains of our native fauna and flora remains only because agriculture has not got around to destroying it. The present ideal of agriculture is clean farming; clean farming means a food chain aimed solely at economic profit and purged of all non-conforming links.... Diversity, on the other hand, means a food chain aimed to harmonize the wild and the tame in the joint interest of stability, productivity, and beauty. Over the last 15 years, the population of Monarch butterflies at their winter habitat in central Mexico has declined, according to some estimates, by nearly 80 percent. While there are multiple causes for this effect, possibly even cell towers and Illinois traffic, one of the largest contributing factors has been the loss of milkweed, the primary food source of Monarch larvae and the only plant on which Monarch butterflies will lay eggs. The spring migration from Mexico to Canada typically takes six generations to complete. But according to National Geographic, between 1995 and 2013, the amount of milkweed in the United States "decreased 21 percent." All signs suggest that the culprit for this loss has been modern agriculture's extensive herbicide use and all-out assault on weeds. Although it's not necessarily causation, consider that many herbicide-resistant GM crops also received commercial approval in 1995. Today, approximately 90 percent of corn, soybeans, and cotton grown in the U.S. are resistant to herbicides. From 1996 to 2011, herbicide use increased by 527 million pounds. Would the extinction of Monarch butterflies have any commercial impact? No, and that's how we reached this point. The real question is whether we going to allow a unique and beautiful animal to die out in our lifetimes, thanks to our carelessness, without doing anything. It's about recognizing a value that doesn't show up in a financial statement and rejecting a future in which our grandchildren have never seen the brilliance of a Monarch. The Georgia Milkweed Project is a voluntary program to establish native habitat for Monarch larvae, as well as a stable food source for other pollinators. The concept is simple: Whether you're a farmer or a gardeners in the state, grow milkweed where you can, save and share the seeds, and report back on the number of seeds you've planted and Monarch larvae you've observed to measure the program's effectiveness. This idea arises partly out of an effort to promote cooperation among large row-crop producers, smaller organic farmers, and home and community gardeners. It's not the fault of a cotton farmer in South Georgia that 99 percent of his or her crop is herbicide tolerant. We can all do out part wherever we can plant a seed. While there are some outstanding nonprofits currently working to revive the Monarch population, basuc conservation efforts are lacking in Georgia. The Xerces Society, which has an innovative partnership with USDA Natural Resources Conservation Service, does not have resources in Georgia for its Milkweed Seed Finder. Monarchs Across Georgia lists potential suppliers, but this may be a more effective, community-based approach to try first. Cooper Agricultural Services, LLC will facilitate a free seed swap between those with milkweed on their properties and those who want to grow it. Outside of signing up to participate, the only requirements are to plant appropriate varieties of milkweed, share seeds with other interested growers, keep an annual count of the number of milkweed plants and Monarch larvae and butterflies that visit your site, and take note of any interesting phenomena. And, of course, you have to report that information back to Cooper Agricultural Services on a regular schedule. If you have milkweed growing currently, simply save the seed and label it, and notify Cooper Agricultural Services of the variety of milkweed seeds and the number you are willing to share. If you are not growing milkweed but you want to, you will be connected to someone willing to share seeds. You will have to send a SASE, and you must agree to all of the conditions stated in the paragraph above, including sharing the seeds from your milkweed plants with other growers in the future. If you have ever purchased seeds from the Georgia Department of Agriculture's Market Bulletin, this will be a piece of cake. Please proceed to the sign-up form below. 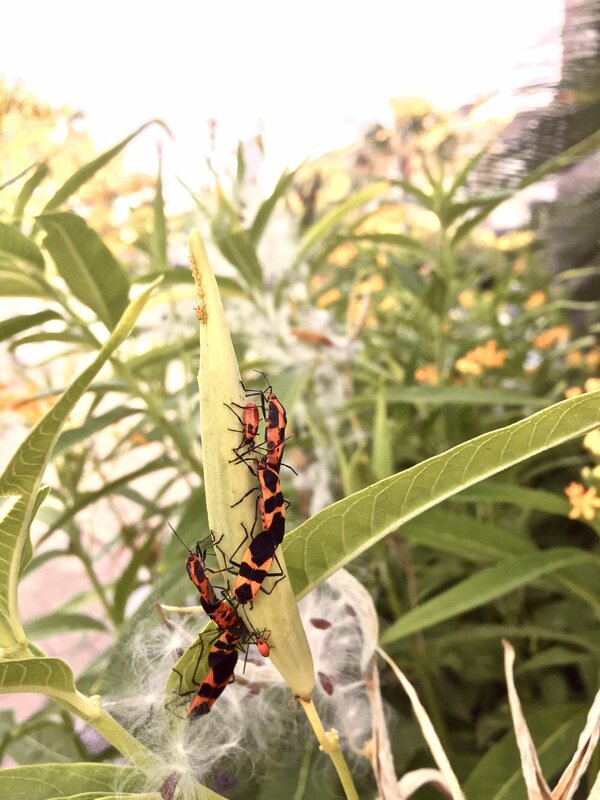 Large milkweed bugs with milkweed aphids. Silky seeds of butterflyweed in background. By submitting your information below, you agree to cultivate milkweed, share seeds with other project participants, and record and regularly communicate data to Cooper Agricultural Services regarding germination, number and variety of milkweed plants under cultivation, number of Monarch larvae and butterflies at your location, as well as other pertinent information. You also agree to receive periodic email communication from Cooper Agricultural Services on the direction of this project and potential future opportunities. Cooper Agricultural Services will not share your information with any outside party. However, by submitting this form you consent to having your physical address shared with another project party for the sole purpose of facilitating the exchange of milkweed seed. Please identify whether you would like to share or receive milkweed seeds. Tropical milkweed (Asclepias cuassavica). Although this variety is a viable food source for Monarch larvaue and available at many retail outlets, it is not native to Georgia and is not a preferred source of seeds.